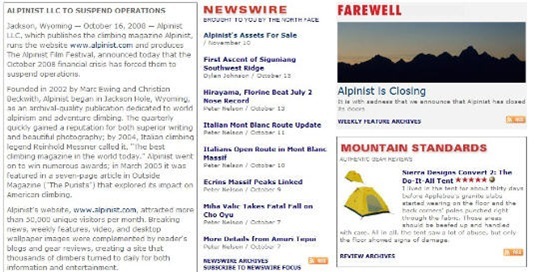 You might be asking yourself why I continue to post about a climbing magazine like Alpinist that so few people cared about it went out of business. It’s a good question, but I find the Alpinist saga to be rather fascinating…and I have an expensive 4 issue subscription with 3 issues still owed to me. Plus the magazine happened to be quite good. Jeffersonville, Vermont—January 16, 2009—Height of Land Publications (HOL), owners of Backcountry and Telemark Skier Magazines, closed on a deal today that lays the groundwork for the resurrection of Alpinist Magazine. Alpinist, a premium quarterly celebrating mountaineering and the climbing life, closed its doors this fall, just prior to the release of Issue 26. The new owners, HOL, plan to release Issue 26 on March 1, and will honor all current subscriptions. And at HOL, they feel it’s a great time to be bold. Jon and HOL partner and Backcountry editor Adam “Howie” Howard are currently in negotiations with the editorial staff at Alpinist to determine who will be at the helm. Readers can also look forward to the same quality of paper and a large format size. Stay tuned to Backcountrymagazine.com and Alpinist.com for more information. Seems like good news for anyone with any outstanding subscription! Cool. Alpinist fills a nice niche, and even though I have never and will never go into the death zone, I enjoyed reading and oogling the pics. Good news indeed. Sweet! Thanks for keeping up with this one, Narc. I, too, have an outstanding subscription, and I’m so happy to hear I will be getting new issues!! Well thats some good news! Clearly just a sign of how awesome they think your work is!